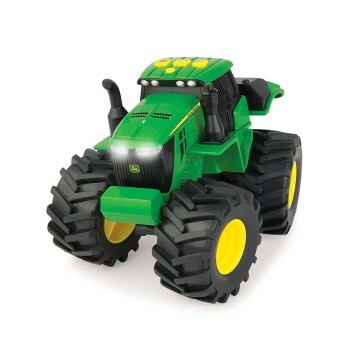 * Make your mark on the landscape with the John Deere Monster Treads Lights and Sounds Tractor! * Hit the 3 action buttons on top of the cab to activate realistic engine sounds, horn and flashing lights! * Super bouncy oversized Monster Tread tyres combine with working suspension to make light work of obstacles! * Made of tough, durable plastic and real rubber tyres, perfect for outdoor play.